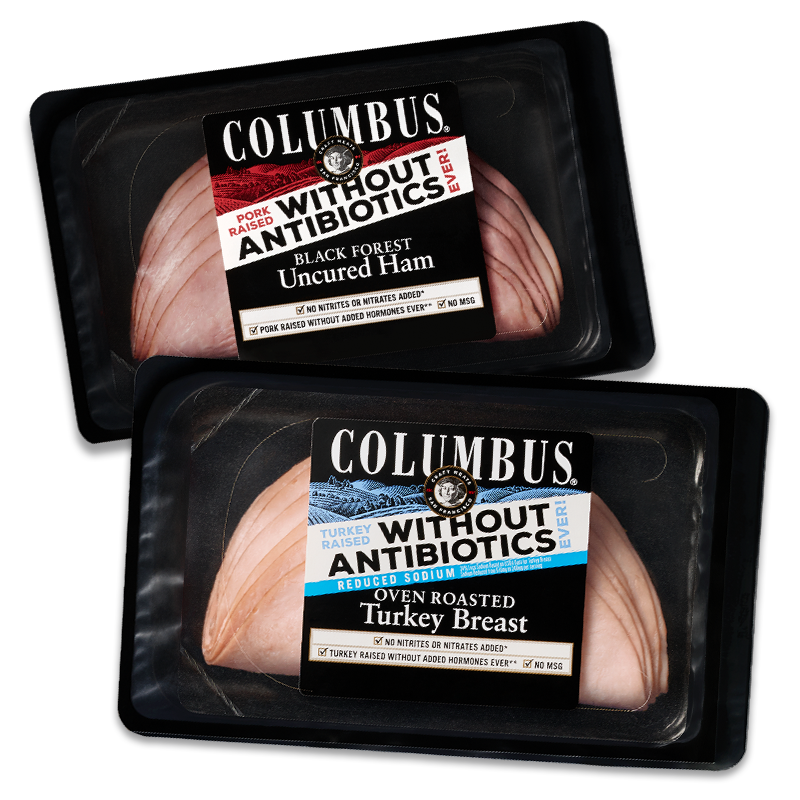 At Columbus Craft Meats, we continue the journey to convert our products to antibiotic free (ABF) meat. 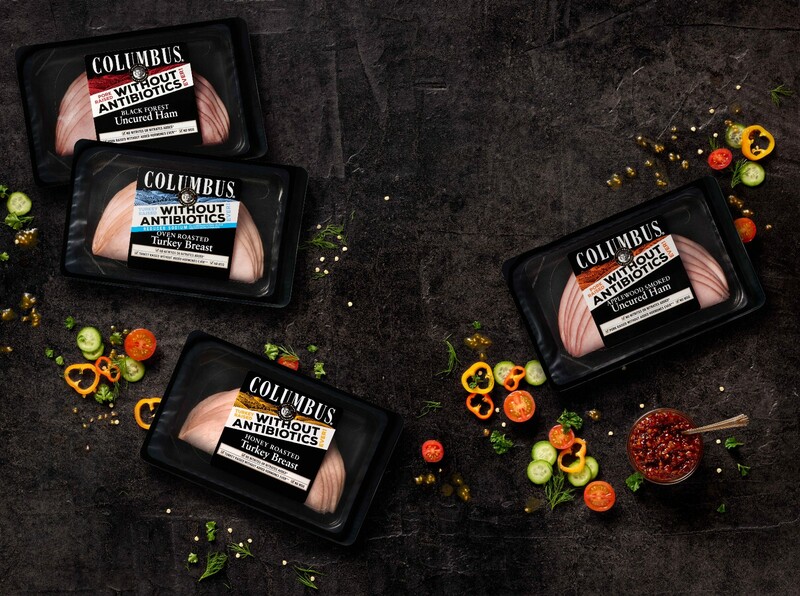 The most recent step is the launch of our new line of antibiotic free lunch meats with simpler ingredients and no nitrates or nitrites added. As part of this launch, we are also converting our existing line of pre-sliced deli meats to ABF as well. Each of them contains only whole ABF turkey/chicken breasts or premium ABF cuts of ham/beef. We added in natural ingredients and minimized the processing to maintain the texture and taste of the meat. This is nothing like the overly processed, slimy and tasteless lunch meat you’re used to. Even more exciting… these deli meats taste f#$%@g awesome. Seriously. Buy some (here’s a coupon) and compare to what you get regularly. You’ll wonder what you’ve been eating all these years. And your kids will love it too. Which means they’ll love you more. You’ll be a hero. A rock star parent. The Reduced Sodium Oven Roasted Turkey Breast, which is made from 100% whole breast and seasoned with special herbs. The Honey Roasted Turkey Breast, also made from 100% whole turkey breast meat. It brims with flavor from a real honey glaze that is not-too-sweet. The Black Forest Uncured Ham is prepared from extra-lean whole cuts of ham, sweet-cured and naturally smoked. Guaranteed to be a go-to favorite for ham lovers. The Applewood Smoked Uncured Ham boasts naturally smoked premium cuts of ham that are cooked in a smokehouse with applewood chips for a sweet and smoky flavor. Delicious in wraps, sandwiches and party trays. The Rotisserie Style Chicken is made from 100% whole chicken that we oven-roast to golden perfection for that classic Sunday dinner taste. The Peppered Turkey Breast is seasoned with cracked peppercorns and a variety of spices, then slow roasted to highlight their delicious peppery bite. The Herb Turkey Breast rubbed with a special blend of rosemary, garlic, crushed peppers and parsley and them roasted until it’s juicy and tender — perfect in a sandwich or on a salad. For our Seasoned Roast Beef, lightly seasoned top round cuts of beef are hand trimmed and then slow-roasted in their own juices. Their mouth-watering taste honors the real flavor of beef. Our Uncured Pastrami is made from a an extra-lean cut of USDA Choice Top Round beef that is seasoned with crushed peppercorns then naturally slow-roasted until it’s tender and delicious. You can find these on Safeway shelves in Northern California now and will be arriving at other retailers later this year. Look for them where you buy pre-packaged lunch meat and also near the deli counter. We aren’t the first to offer ABF lunch meat, but we are setting the standard in quality and taste. No longer do you need to settle for lunch meat that is overly processed, tasteless and slimy. In short, lunch meat now has a role model. We would love to hear what you think of them! Leave a comment on our Facebook page or give us a call 855–566–2800.